Its been a while since I wrote a review! I have been trying to reign in my budget a bit by going through my existing stockpiles before purchasing anything new, but I had the opportunity to try Gyokushodo’s new line up of nerikoh offerings earlier today thanks to Kotaro-san from Japan Incense. On first analysis all three blends contain the typical Ume-gaka style ingredients, including camphor, clove, cassia and agar wood. They each start off with a blast of camphor and clove, and then settle down into a sour plum fragrance, and eventually wrapping up with a nice woody agarwood aroma. The difference in the three though is the concentration of ingredients. Whereas Kusa no To is the lowest price point of the three, it is obvious it has less of the key ingredients than the next two up the line, and does not project as much. Hanafuna ups the game a bit, and Shiun does that but also seems to have extra agar wood added to it. 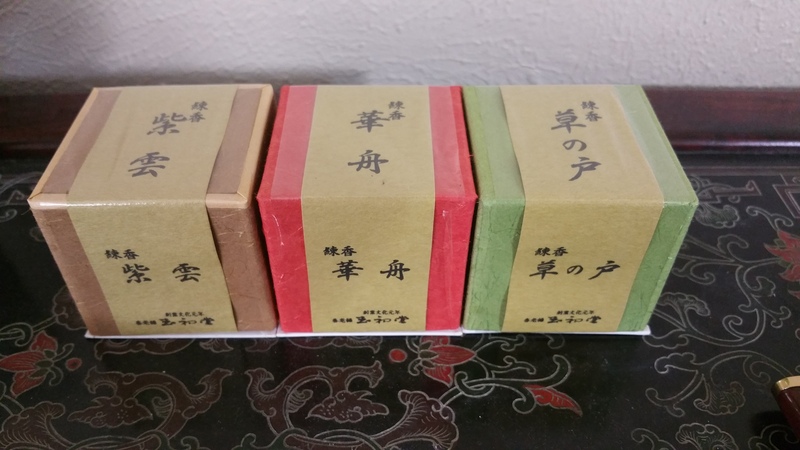 These two Kunjudo ranges, all of which are exported directly to the US rather than via Encens du Monde, feature some of the company’s lowest end incenses and as such could be comparable to similar Shoyeido or Nippon Kodo lines. In fact the Japanese Gardens line does have some similarities to Shoyeido’s Daily series, while the Less Smoke incenses remind me quite a bit of Nippon Kodo’s Morning Star line. The former, in general, strike me as traditional or natural scents, while the others definitely have synthetic qualities that often seem to come into less smoke incenses. And it should be said that while these do have less smoke, they are not smokeless. Tea Garden is the line’s green tea incense. I thought this one smelled almost identical to the Green Tea incense in Kunjudo’s Three Scents packaging, enough where I did a side by side. I don’t think they’re identical, with Tea Garden’s green tea oil not quite so intense, but they’re definitely close enough where you’d need one or the other. Having tested out a few Green Tea incenses recently, this one might be the one I liked the most in that it does have a noticeable element of leaf or oil in it. It’s going to be up to the user whether or not Fruits Garden is to their tastes, as I can’t think of too many fruity incenses that would appeal to me. This bouquet is kind of like a mix of apple, pear and cherry and as such has a fruit bowl smell, which tends to be less distinctive than if they went for one particular scent. While it does have some synthetic notes to it, the sandalwood base (and this is true for all this line) carries it past those notes for the most part. I can imagine this could be considered quite nice for those going for this sort of scent. Bonsai Garden is well named, a spicy evergreen scent with hints of cypress and conifers. It’s not really a pure pine or evergreen incense because of the spice and it finishes with a bit of sweet perfume. Overall this is why I’ve written this as sampler notes, as I wasn’t anywhere close to getting a bead on the overall scent and thought this could be quite nice. Moss Garden‘s a bit indistinct and it’s certainly nothing like the Shoyeido incense of the same name. I remember the aroma here being kind of muted and soft with hints of wet moss and a slight, lifting oil in the back. There’s a bit of fruit or lavender in there somewhere as well. Stone Garden goes for a really spicy scent, with a strong cinnamon and floral content. I didn’t have enough of a sample to decide on whether it was distinct enough from other similar blends, but this kind of thing is generally to my liking. The obvious comparison from the music world would be the difference between 70s analog and 80s digital technology. The former’s generally fuller and more natural sounding, where the latter, before technology caught up, provided thin and inaccurate samples that were photographs to the analog’s reality. This incense range is similar. The Plum struck me as being thin, almost like an approximation of other plum blossom incenses, and I suppose it suffers from me being on a Kobunboku trip recently. The Cherry Blossom is similar, but doesn’t have the Plum’s slight bitter notes making it a little friendlier. But like most of the line this is more in the vein of sprays and home deoderizers than traditional incense, and thus less to my liking than something like Shoyeido’s Daily version. The Lavender, in particular, reminded me of a Nippon Kodo Morning Star blend, with an aroma that’s obviously synthetic and only remotely like its original oil or herb, but I did like this one more than the prior two, maybe even BECAUSE it’s not like lavender oil, something that doesn’t vary all that much when its pure. Both the Rose and the Lily of the Valley are scents I generally have a bit of trouble with in the first place, so I think my opinion can be extrapolated from the rest of the line without needing to keep firing away. As I mentioned earlier it’s important to compare your own aesthetics to my own in these cases as I tend to prefer traditional scents and many of these are quite floral. That is while I felt fairly comfortable talking about the Gardens line, the Less Smoke line isn’t something I’d necessarily seek out on their own and was mostly curious about how good they’d be considering so many of the high line Kunjudos are so good. Daihatsu are a Japanese company marrying the art of incense with French perfumery. Very few of their incenses currently imported into the US could be considered traditional. The incenses in question here, more so than the line represented by the black boxes, represent a modern vision that while working with some common ingredients, end up creating entirely new bouquets. These are rather unlikely to appeal to traditionalists or ingredient purists, but in most cases Daihatsu manage to create partially synthetic incenses that don’t usually have harsh or offputting notes and could be considered superior to lower quality incenses that do the same thing. The following are notes on this range based on partial sticks. Young Leaves is an incense with a sweet, autumnal aroma. It has hints of musk, new carpet and mint and is overall a bit on the sharp side. Like most of these aromas the scent is pretty powerful and perfumed. At times it reminded me of the mintier Shoyeido 12 months incenses, except not quite as refined. Overall, quite nice. Plum Tanka isn’t all that similar to your traditional plum blossom incense, it’s more of a floral bouquet. Due to the perfume the scent is much more up front and distinct, but you actually get more fruit than blossom, with what reminds me of rose on top. I liked the fact the overall scent tended to the dry side rather than sweet. Violet Tanka is a rather picture perfect inexpensive violet perfume, well rounded, but a bit on the soapy side at times, which I think is more of an indicator of my relationship to floral incenses than anything else. Like the whole range it has an unsual aromatic strength and in many ways it feels like an alternate version of the Plum Tanka. Daihatsu’s Sandalwood is so close to a traditional sandalwood that it either is or they’ve downplayed the perfumey elements on this one and as such it stands out like a sore thumb in the line. It has a very contoured sandalwood aroma, definitely aiming for the heartwood sort of scent, but with a bit of spice giving it a bit of richness. Perhaps as this is closer to my tastes than the florals, I found it fairly impressive for hitting the right notes, although overall it doesn’t differ that much from most heartwood sandalwoods. The best of the line, unsurprisingly, is the Tokusen Tanka. We’re definitely flat into perfume ranges here, there’s almost nothing about this incense that will remind you of the traditional, rather it smells like someone’s fantastic, sultry perfume and as such may be a bit too much for an incense. It’s by far the boldest scent in the line, minty, sultry and modern like some of Shoyeido’s LISN line. Roughly it falls into a green tea/patchouli sort of area, without really being too strong on either note. Lilac Tanka is by far the most synthetic smelling in this range, but that’s an opinion I almost always get with florals such as this, there’s a real soapy feel to this that reminds me of Indian incenses at times. Overall it’s about what you’d expect, lilac perfume, something not really all that attuned to my tastes. There’s also another four boxes, mentioned above, that Daihatsu create that still work with perfume but end up in much more traditional areas. Of these I liked the Myo-jyou and Kaizan enough to buy boxes, but found over time that the perfumy nature made it so that I wasn’t reaching for them quite so much. I do wonder if I’d take a similar track with any of the Tankas, but I’d take that as a more traditionalist opinion. If you like modern scents, a sampler might be worth a look as I definitely think this line is more superior to, say, similar Nippon Kodo incenses.